Last year, the Nexus series from Google officially died, and a new ‘Pixel’ series was born. Google marketed its Pixel devices of last year by mentioning that they are ‘Made by Google’. Well, rumours and reports suggest that HTC manufactured the devices. There were both good as well as bad things in the phones. Talking about good ones first, the Pixel and Pixel XL are still the best smartphones when it comes to the best Android experience. They have excellent cameras, 3.5mm headphone jack, no camera bump at all, fast charging, etc. Coming to the bad things, the design was undoubtedly awful; there was no IP67 or 68 rating, no stereo speakers, huge chin or a large bezel at the bottom of the phone, no wireless charging, pretty expensive as the price started at $649 for regular Pixel. Now, the Google Pixel 2017 and Pixel XL 2017 are launching in September or October, and the designs of the phones are already out. In this article, let’s talk about the reasons why the Google Pixel 2017 will or won’t be successful. And keep in mind that we will be talking about Pixel 2017 and not the Pixel XL 2017. Let’s talk about something that Pixel phones are well known for – the Software. We are all aware that the final Android O release is happening soon after all the four Developer previews. Now since Google Pixel smartphones are well known for their pure stock Android experience, the Pixel 2017 will have the pure Android O experience that will make it one of a kind. There are very few companies except Google itself that promise to provide a nearly stock Android experience. Some of the names include Motorola, Nokia, Lenovo ( the company just announced the same), etc. Now, you might have tried different phones having little bits of unique features in their launchers/software, but sometimes there are just too many “features” that end up taking up space, slowing down the phone, and use up battery. Also, stock android is simple and so lightweight that runs great on a 3-year-old phone. Remember that the Galaxy S3 international didn’t receive an update because it had 1gb of RAM and couldn’t handle TouchWiz (Samsung own words) [REDDIT]. Talking about the updates, Google promised official Android updates for the last year’s Pixel devices up to Android P so we can surely expect the 2017’s Pixel phones to get official Android updates till 2020. Next thing that will make the Google Pixel 2017 a successful phone is the camera. Ok, so there is no dual camera thing happening with both the pixel phones of this year but looking at how the last year’s Pixel phones delivered great cameras, we can surely expect the same this year. Also, software plays a big part in the quality of the camera. With the stock Android and Snapdragon 835 (Since there is no Snapdragon 836 this year), the camera department of the phone will be solid. Lastly, with software without any bloatware, we can expect great battery life on the Google Pixel 2017. Starting off with the design, the leaked images have revealed that there is no bezel-less display and in fact, the Pixel 2017 has large front bezels. 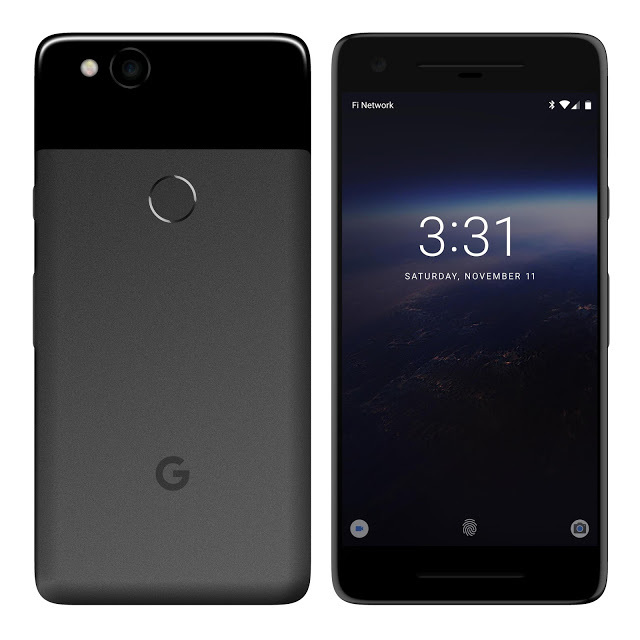 The Google Pixel 2017 looks the same as last year’s Pixel except for the fact that there is now a front speaker on the bottom chin. Still, when bezel-less phones are launching every week, it is weird that Google is still sticking to the 2014’s smartphone design. VOTE: POLL – What are your thoughts about the Google Pixel 2017 Design? Next, there is no headphone jack. Since Apple removed it from the iPhone 7, it has inevitably become a feature now. So, people who are going to buy the Pixel 2017 will have to rely on a USB Type-C to 3.5mm headphone jack dongle to listen to the music if they have any headphones with 3.5mm jack. Now, we are pretty sure that the 2017’s Google Pixel devices are going to be waterproof but in case they aren’t, it will be a joke to remove the headphone jack. Now, last year’s pixel phones were a little overpriced for what they offered. If the same thing happens this year, the Google Pixel 2017 might retail for $650+ again and then; the price will go up to $800+ for the 128GB Pixel XL 2017. Not a good thing, right? Lastly, we know that even with a single camera, Google Pixel 2017 can turn out to be one of the best camera smartphones. But, when every smartphone company is now adopting the dual camera thing, it is sad to know Google is still sticking to the single camera setup for its high-end smartphones of 2017 that are going to compete with the likes of Note 8, iPhone 8, LG V30, etc. Well, one thing that you should keep in mind before criticising the article that these are our views. You might have different thoughts on the Google Pixel 2017’s design and features. Anyways, do let us know what do you think about the design of the Pixel 2017. As always, the comments section is there for you. Is this how the Google Pixel 4 (or Pixel 4 XL) going to look like?